Find out the best chores list as recommended by age and download free chore charts for kids. Starting at a young age helps develop children responsibilities and teaches that it is fun to do things around the house, especially if you start when they are eager and willing. After reviewing the list and assigning your children chores, you may also take into account their own unique abilities to do things. In some cases it may be necessary to work towards a particular job, such as having them simply put clothes into the washer or dryer. You may also have younger children assist you in sorting laundry, which can be a great matching activity. Making sure everyone older than 2 years of age has at least one assigned chore is important to promote family contribution and help them see that you are a team that works together. The chart shows at what age a child is capable of performing a task, but it does not necessarily mean that they will be able to do a good job at the task. Avoid criticizing any children under 5 years of age that would discourage them from wanting to help. For children 5-8 years old, I would limit constructive criticism to only 1-2 comments at a time AFTER positive praise for completing the job in the first place. For example, if a child is expected to clean their room and leaves their socks on the floor, some blocks and a few pieces of trash, simply say, "Wow your room looks so good! Don't forget your socks and the trash too!" 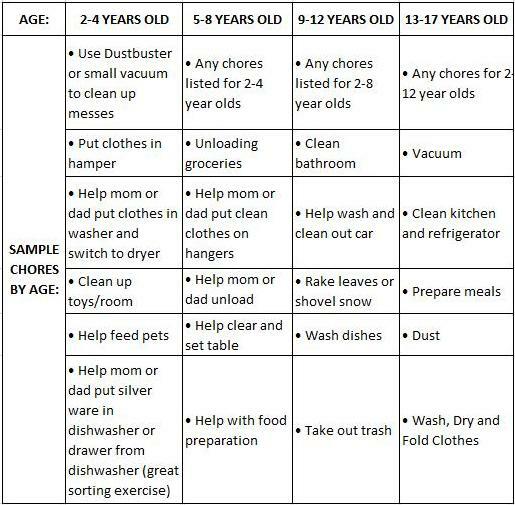 Be sure to check out the tips for getting children to do their assigned jobs and how to effectively use a chart that can be found on the pages chores for kids and kids charts. There are many ways to gain compliance in defiant children so that they actually want to do their chores each day. My favorite is to withhold all electronics until the chores are complete. You'd be amazed at how quickly kids with try to get those chores done! I love having my kids clean their rooms and all their toys up prior to a quick movie.